I’ve written previously about some example R scripts I created to extract sea surface temperature data from NOAA’s Optimum Interpolated Sea Surface Temperature products. 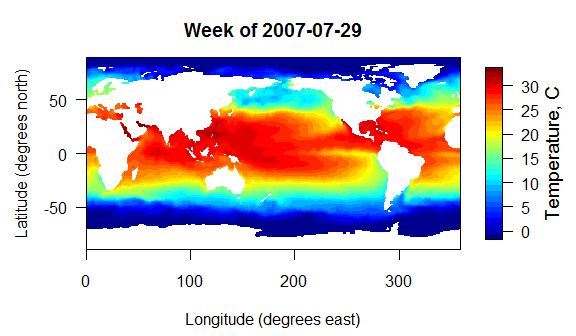 If you want daily global sea surface temperatures on a 0.25×0.25° grid, they gather those into 1-year files available at http://www.esrl.noaa.gov/psd/data/gridded/data.noaa.oisst.v2.highres.html. If you want weekly average SST values on a 1×1° grid, you can get those back to 1981 at http://www.esrl.noaa.gov/psd/data/gridded/data.noaa.oisst.v2.html. If you just want a smaller file for a single day on the 0.25×0.25° grid, you can find those at http://www.ncdc.noaa.gov/sst/griddata.php. 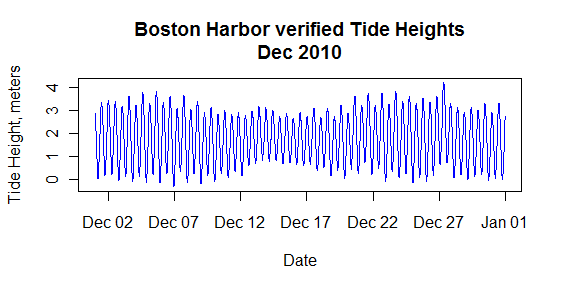 Boston Harbor tides for December 2010, retrieved from NOAA CO-OPS server.